 Sheep anti Rabbit IgG antibody recognizes rabbit IgG (Heavy and light chains). Cross reactivity with bovine, human, mouse or rat serum components has been minimised by adsorption. Sheep anti Rabbit IgG antibody has been used extensivley as a secondary reagent for the detection of rabbit polyclonal antibodies in immunohistological (Pimanda et al. 2006) and ELISA (Herndon et al. 2010) applications. Antisera to rabbit IgG were raised by repeated immunisation of sheep with highly purified antigen. Purified IgG was prepared from whole serum by affinity chromatography. Rabbit IgG from pooled sera. Blakey, D.C. et al. (2002) Antitumor activity of the novel vascular targeting agent ZD6126 in a panel of tumor models. Clin Cancer Res. 8 (6): 1974-83. Pimanda, J.E. et al. (2006) Transcriptional link between blood and bone: the stem cell leukemia gene and its +19 stem cell enhancer are active in bone cells. Mol Cell Biol. 26: 2615-25. Dell'Accio, F. et al. (2006) Activation of WNT and BMP signaling in adult human articular cartilage following mechanical injury. Arthritis Res Ther. 8: R139. Clements, K.M. et al. (2011) Matrix metalloproteinase 17 is necessary for cartilage aggrecan degradation in an inflammatory environment. Ann Rheum Dis. 70: 683-9. Saulnier, A. et al. (2013) The Doublesex Homolog Dmrt5 is Required for the Development of the Caudomedial Cerebral Cortex in Mammals. Mitić, T. and McKay, J.S. (2005) Immunohistochemical analysis of acetylation, proliferation, mitosis, and apoptosis in tumor xenografts following administration of a histone deacetylase inhibitor--a pilot study.